Loose-fitting, free-sized-tops in cool viscose. 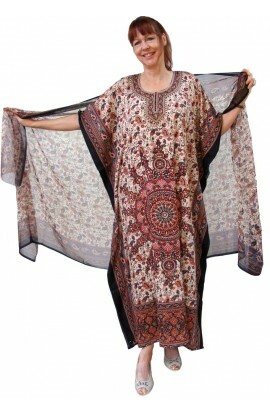 Each top is cut in our traditional kaftan shape and is suitable to loosely fit all sizes up to bust and hips 64"
Obviously, the more slender the wearer, the more folds and looseness the top will have. 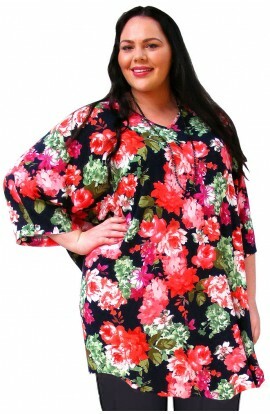 To give you some idea, the model wearing these tops is UK size 16-18. All the tops are 31" in back length. 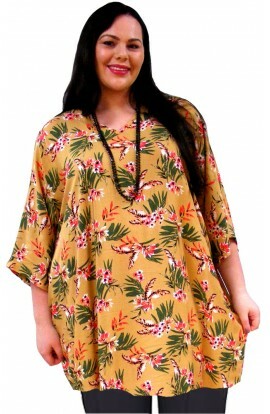 Cool Viscose loose kaftan top. Free-sized to loosely fit UK 14 to 30. Length 31" Suits medium to large plus size. ..
Plus size Top - AUBERGINE - CHRYSANTHEMUM Free-sized to loosely fit UK dress 14 to 28 Back length 31” V neckline Fabric: Cool Viscose MB Size and style variations available as Bespoke items – please enquire ..
Kaftan Top - Ochra Oriental Free-sized to loosely fit UK dress 14 to 28 Back length 31” V neckline Fabric: Cool Viscose MB Size and style variations available as Bespoke items – please enquire ..
Kaftan Top - RED FLORAL Free-sized to loosely fit UK dress 14 to 28 Back length 31” V neckline Fabric: Cool Viscose MB Size and style variations available as Bespoke items – please enquire ..
PLUS-SIZE TOP IN VISCOSE TWILL - BLACK-GOLD-RED Free-sized to loosely fit UK dress 14 to 28 Back length 31” V neckline Fabric: Viscose Twill MB Size and style variations available as Bespoke items – please enquire ..
PLUS-SIZE TOP IN VISCOSE TWILL - BLUE-PURPLE Free-sized to loosely fit UK dress 14 to 28 Back length 31” V neckline Fabric: Viscose Twill MB Size and style variations available as Bespoke items – please enquire ..